Claremore is celebrating St. Patrick’s Day with festivities all day long on March 17 with two events and a shopping dollars giveaway, all located in the historic downtown Claremore. 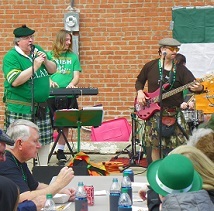 First, citizens can come out for the ninth annual Bangers and Mash Lunch, complete with live entertainment, giveaways and an Irish stroll along the sidewalks, at the Claremore Daily Progress parking lot, 315 W. Will Rogers Blvd. Lunch is $6 and includes the Irish staple “Bangers and Mash” (sausage and mashed potatoes), a drink and dessert. The lunch is from 11 a.m. to 1 p.m.
At the Eason Collision Stage, two acts will entertain crowds as they eat their lunch or enjoy the afternoon run. Timothy O’Brian’s Celtic Cheer and Travis Peck will perform. After a nap or finishing up another week at work, guests are invited back to downtown Claremore for the St. Paddy’s Day Party at the Main Street Tavern parking lot. The party will provide another opportunity to eat bangers and mash or sample some corned beef and cabbage, partake of adult beverage options and see to more live entertainment – including an encore performance from the always popular Timothy O’Brian’s Celtic Cheer. Also performing on the Eason Collision Stage will be Frank Smreker and the Goode Academy of Irish Dancing. Guests can order Miller Light, Guinness, red or white wine and Jameson outside at the party. A full bar and food menu will be available inside. Claremore Main Street will be selling T-shirts and specialty St. Patrick’s Day cups with the new St. Paddy’s Day Party logo that change from white to green with cold drinks. Cups are $5 and are good for a dollar off each beer outside that night. T-shirts are $15. The party is not limited to adults 21 and older, but IDs will be checked for those wishing to drink. Finally, anyone can enter to win up $450 in Green Bucks – shopping dollars that can be spent like cash at 18 participating stores in downtown Claremore. The Pot-O-Gold Giveaway is easy to enter. Visit any of the participating stores between March 1 and 16 and fill out a drawing ticket. No purchase necessary. Some stores offer additional tickets with purchased items, however. At the Bangers and Mash Lunch, one ticket will be drawn for the $450 grand prize. The winner need not be present. Two smaller $50 giveaways will also be done during the lunch, but guests will need to be present to win one of those. The participating stores are: Belvidere Gift Shop, Bike About Bicycles, Boarding House Books, Boomerang Diner, Centsible Spending, Cozy Cottage, Cranberry Merchant, District on Main, Grapevine, Haberdashery, LoliPop: A Sweet Boutique, Mad Dog’s Emporium, Outwest Home Décor, Rhapsody Boutique & Spa, Sailor Antiques, Thrift Harbor, Vintique Charm & Boutique and Will Tree Mall. Claremore Main Street is a 501(c)3 nonprofit organization that works to enrich downtown Claremore by promoting a healthy downtown economy, advocating for revitalization and historic preservation and hosting quality of life activities. Proceeds from the events benefit the organizations efforts. The Presenting Sponsor for the Bangers & Mash Lunch and St. Paddy’s Day Party is Pixley Lumber. The Party is cohosted by Main Street Tavern. A full list of sponsors and additional information about the events is available on Claremore Main Street’s website, downtownclaremore.org, or by calling 918-341-5881.